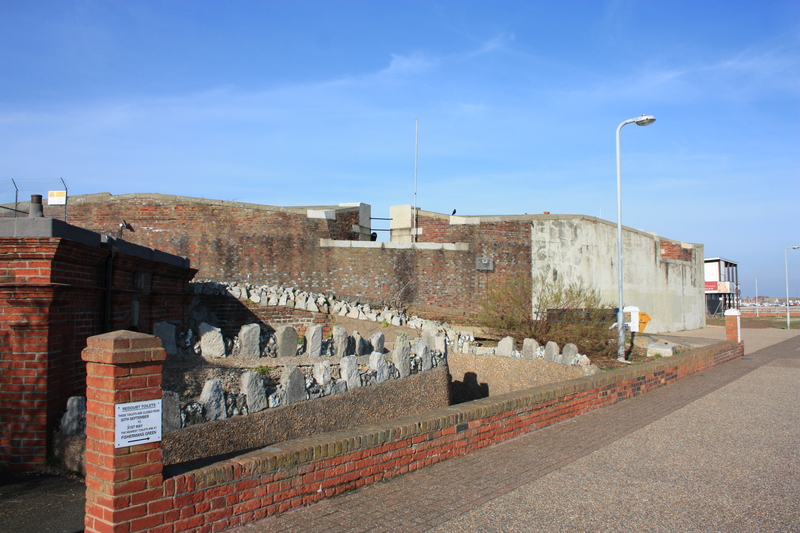 We have seen many Martello Towers, coastal artillery forts, and other historical round structures on our travels. Thus, when we left Sovereign Harbour and saw another interesting round structure up ahead, I wondered when this one had been built and for what defensive purpose. This one looked big and impressive – it had to be strategically very important! As we got closer I realised that the brickwork looked at bit modern for the Tudors. And for the Napoleonic era. In fact, the building looked very modern indeed. 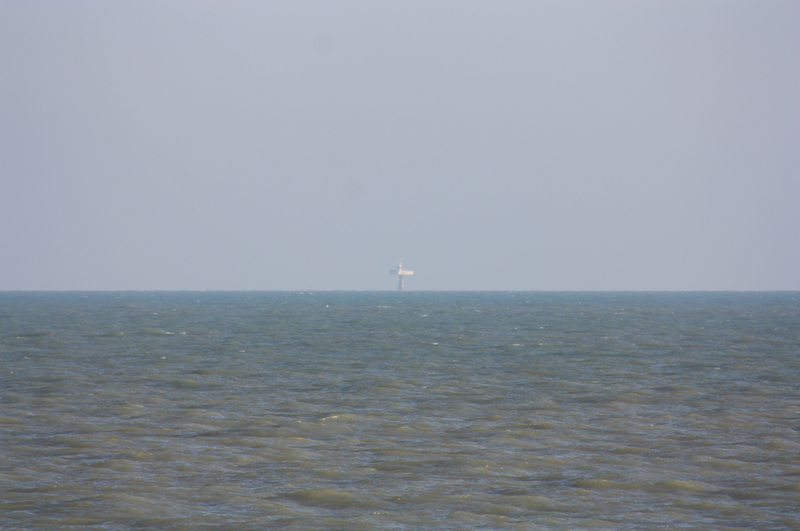 Then we saw a sign – this was the Eastbourne Wastewater Treatment Works! It’s design was based on other circular Napoleonic structures along this stretch of coast. What a great design, I thought! Wastewater from 140,000 people passes through here every day. That’s 74 million litres according to the sign, or 528 litres per person per day, which I have to say seems a bit high to me. I am sure I read somewhere that 500 litres is more the average daily consumption of a family of four, although I may be wrong. Or, the people of Eastbourne may just wee a lot. Either way, beneath our feet is an underground chamber, 10 metres high and the size of a football pitch, processing all of this waste water. It is treated here and then pumped three miles out to sea. A short while later, we did in fact pass a circular structure which was more historic in nature, the Eastbourne Redoubt. This was built between 1804-1810 to support the local Martello Towers. I understand it is quite impressive, but it did not exactly present its best side to us as we walked in front of it. 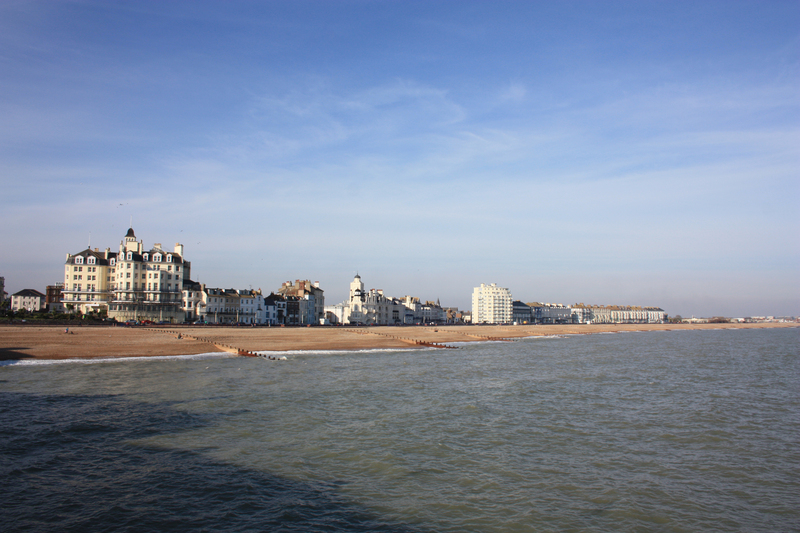 We didn’t stop, but walked one, towards Eastbourne Pier. As we walked, we happened to notice something out in the sea. It seemed to be some sort of enormous vessel emerging from the haze. We couldn’t tell exactly what it was; it was too far away. I fitted the zoom lens to my camera and tried to get a better look. What was it? Here is a closer look, though the haze. 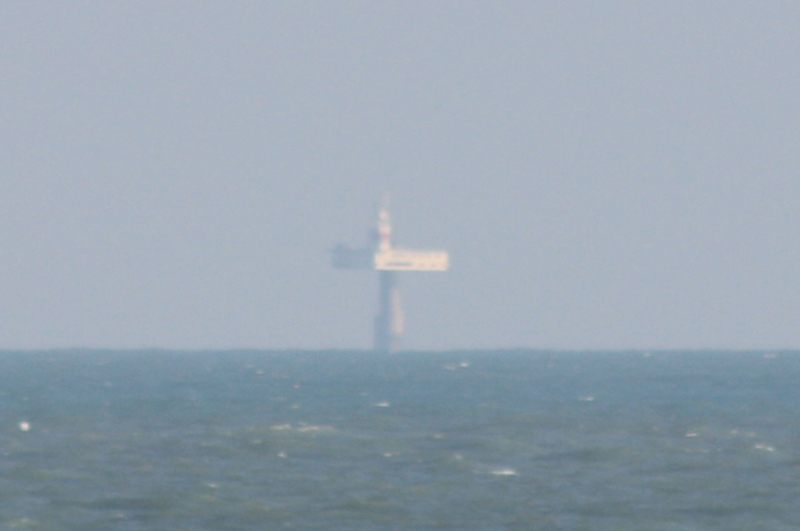 This was the Royal Sovereign Lighthouse, located some 6.75 miles out at sea. 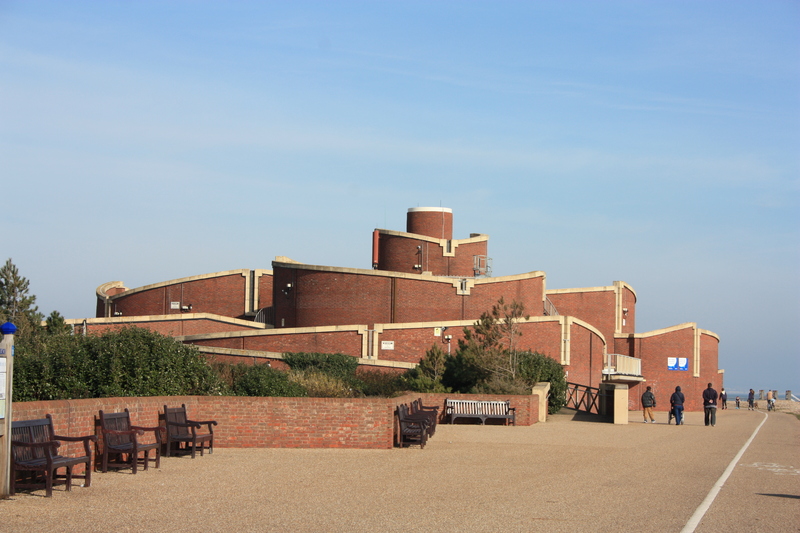 It is a concrete structure built in Newhaven in two parts, a vertical pillar and a platform base, and completed in 1971. It replaced a former light vessel which had marked the position of the Royal Sovereign Shoal since 1875. The two parts were floated out to sea and then the pillar sunk. It had a telescopic section which was winched up 13 metres and then locked into place (you can just make this out in the close-up photo, where the pillar narrows). The platform originally had accommodation for the lighthouse keepers before it became fully automated in 1994. 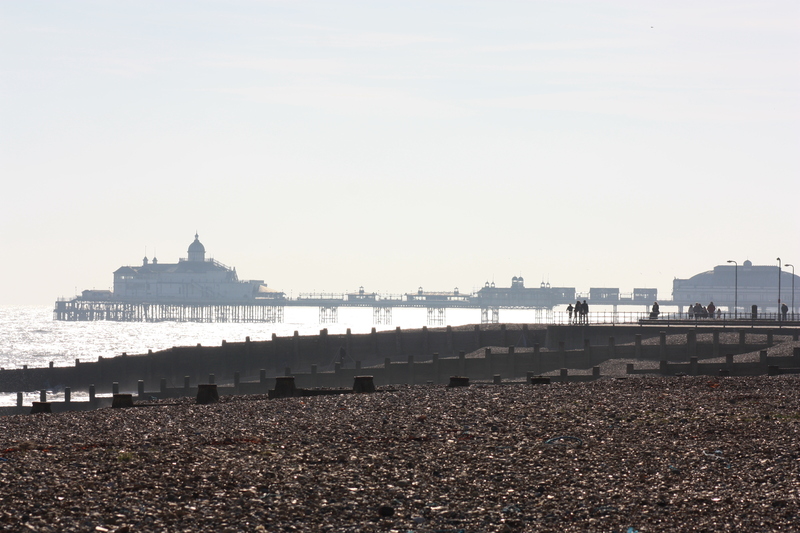 We gazed at the platform for a while, trying to make it out clearly, and then headed off towards Eastbourne Pier. 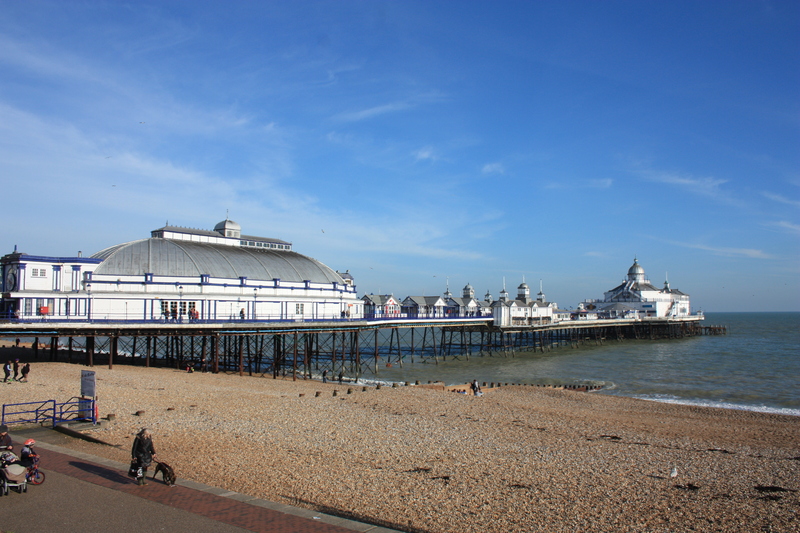 Eastbourne Pier was opened in 1870. It suffered its fair share of the usual pier-type-of-problems, being partially swept away by a storm in 1877 and partially destroyed by a fire in 1970. Today, it is an attractive structure, though it could do with a lick of paint here and there. It gave us good views back east, so we ended our walk here and gazed back at today’s coastal path. This entry was posted in East Sussex and tagged coast, East Sussex, eastbourne, eastbourne redoubt, lighthouse, pier, royal sovereign lighthouse, sewage works, travel, walking. Bookmark the permalink. Love the pier! It makes me want want to come out and stroll about for the day! I’m guessing that your family members are making rather long lists of places to come back to!